Raise your hands if you're ready for fall? Yeah, us, too. The sweltering summertime heat has officially gotten the best of us and our wardrobes, and we're eagerly counting down the days until we can finally expect a regular dose of cooler, more comfortable temperatures. Sweater weather or boot season—or however you prefer to refer to autumn in fashion terms—is a time to refresh and revamp your wardrobes. While we know you're already stocking up on all of the must-have seasonal essentials—from oversize sweaters to sweater dresses to the perfect fall blazers—there's one question you may be asking yourself: When can I actually start wearing my new fall clothes? Well, you're in luck because we put together a little guide to follow on when it makes the most sense to make the seasonal wardrobe switch. Of course, every place (country, state, or coast) experiences the weather shift at a different pace, but the below rules offer just a bit of guidance on when you can finally wear your new autumn staples. Start packing away some of your more summery summertime essentials (think strappy sandals that can’t really be worn with socks, linen pieces as well as others rendered in lightweight and airy fabrics, and sundresses). A simple rule of thumb? If you don't think the piece can be transitioned into the cooler season, then it's time to stow it away until next summer rolls around. This is the time when temperatures typically start to drop, especially in the nighttime, so it makes the most sense to sport your heavier fall essentials then. A good style rule during this transitional weather? Layer, layer, layer. You can still wear your favorite little white summer dress but throw on an oversize wool cardigan to make it a bit more seasonally appropriate. Check your weather app right away in the morning. What's the expected temperature? If it's going to stay a consistently cool 60 degrees all day long, then you've got the green light to rock your favorite fall ankle booties, oversize autumn sweaters, and statement coats. Because, as you may have guessed, this date marks the first day of fall—i.e., the autumn equinox. And though temperatures can still be in the high 70s during this time of year, especially in the daytime, it just seems like a no-brainer to slowly start switching out your summer clothes for your favorite fall staples on this day. After all, it is technically fall, right? 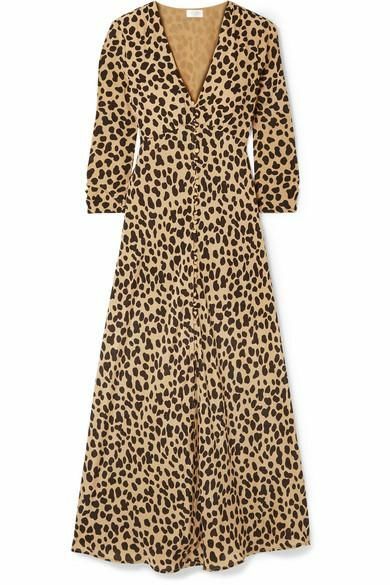 Try fall's fiercest trend by slipping into a leopard-print dress. Fresh fuchsia is a major color for fall. You can't go wrong with anything rendered in a fiery red hue. Make your presence known in a strikingly bright neon piece. Straight-leg jeans are always a classic. Consider this your go-to accessory for every fall activity. A cozy fall find you'll never want to stop wearing. Layer this over your favorite slip skirt or a printed dress. Next up, check out our fall 2018 starter pack, a quick-hit lesson on every major trend to buy and rock this season.